Lostpedia Blog: The Lost Rewatch: 1x08 "Confidence Man"
I've gotten my share of criticism over the past few days regarding these recaps, which people say are starting to be more and more like just synopses. And while I can agree with that, I would just like everyone to understand that not every episode has content that can be drawn to plot a conjecture for the sixth season. Some episodes are only important in their context, and will hold no further meaning. I've been attempting to link to future episodes with these rewatch posts, but sometimes it's a little hard. So bear with me; the really juicy bits will be coming in season two with the deepening mythology of the show. I'm going to be trying a different method of recapping with this episode's blog, so tell me what you think and if you like this way better. Sawyer is reading Watership Down in the first season (or rather, his book is with his things). Watership Down, though it still made mention on the show, was almost a much bigger part of the show through the character of Boone. The character was almost named Boone Anthony Markham V, and would have been referred to on the show as "Five," an almost exact reference to one of the rabbits in Watership Down named Fiver, who has dreams that can tell the future. This is an even bigger coincidence (or lack of one) when we find out that Watership Down was originally Boone's book. We see Sawyer's past as a con-man, a profession he received from Locke's father, Anthony Cooper, who led to the death of Sawyer's parents. Sawyer's inability to let go (as shown in the flashback from "The Incident, Parts 1 & 2" when he is told to stop writing the letter but later continues anyway) is almost certainly what contributed to his becoming a con man, and following in the steps of the man he hated most. At least he'll finally get to kill Cooper on the Island in "The Brig." Kate says she sees humanity in Sawyer. Her hatred of him right now is very interesting to watch, because by the time season three rolls around, that dynamic will be the complete opposite of what it is at this point. Soon after that, Kate reads Sawyer's letter, which we saw him write in "The Incident, Parts 1 & 2." Most of it was actually written with Jacob's pen. Does this mean that Jacob wanted Sawyer to continue down his spiral of self-destruction? He obviously had some form of foresight in visiting him in the first place, so the question remains: why? Locke tries to blame Sawyer for knocking Sayid out and destroying the transceiver, and his lie is very well orchestrated, even though we'll find out later that he really did it. Why? For the same reason he blew up the flame, the sub, and tried to kill Naomi. His connection with the Island is very powerful. 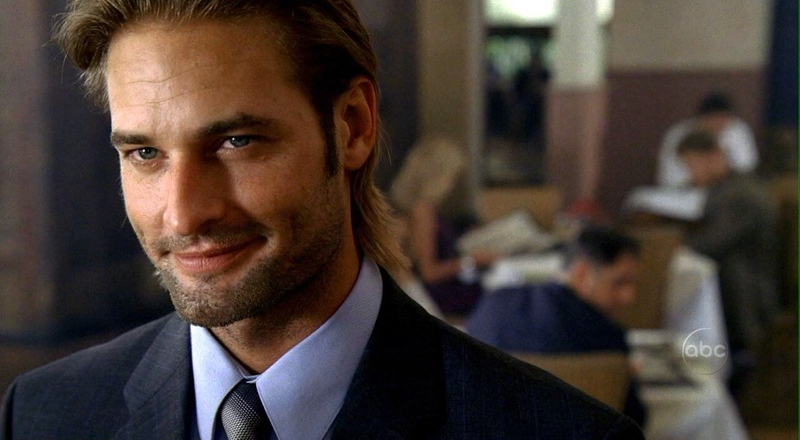 Jessica's husband David mentions a "loophole" while negotiating business with Sawyer in the flashback. While I'm not suggesting that there's any connection--that'd be stupid--it was quite a bit shocking to hear that word so soon in the show, but to not know that it would have such relevance. Charlie asks Hurley if he's hoarding food. Though he's offended now, in a few weeks, when the pantry of the hatch is opened, he'll be hoarding food, fitting right into his stereotype. Sayid's torturous past is revealed through his torture of Sawyer. And who did he learn the skill of torturing from? None other than Kelvin Joe Inman, who lived on the Island for years before the plane crash, and died on the very same day 815 split up in midair. Sayid leaves the beach after the torture of Sawyer. He'll find Danielle Rousseau next episode. But we'll leave that for then. And that's it for episode 1x08, "Confidence Man." You can discuss the episode in this forum thread, read others' posts about it at the rewatch hub, and edit the episode's article.